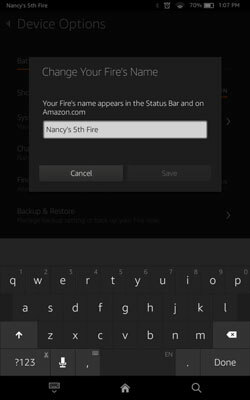 Here are tips and tricks that allow you to fine-tune Fire settings, keep your data safer, find apps beyond the Amazon Appstore, explore the Clock app’s simple features, control data storage, and more. Continue pushing the boundaries of what you can do with your Fire tablet. 1Change your Fire tablet’s name. How do you change your tablet’s name? Simply swipe down from the top to reveal the Quick Settings bar. Tap Change Your Fire’s Name. Tap at the right side of the current name and then press the Backspace key on the onscreen keyboard. Type a new name on the keyboard. 2Remove apps from the Carousel. 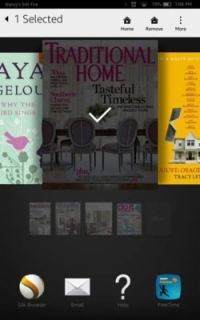 The Carousel is the place where items you’ve recently opened, from books to apps and videos, appear. Although the operating system automatically places recently opened items there, you do have some control over what appears in the Carousel. From the Home screen, scroll in the Carousel to display the item you want to remove. Press the item until a menu appears at the top of the screen. Tap Remove. The item is removed. To add it to the Carousel again, just open it from the related app; your Fire adds it back to the Carousel again. Just like a computer, a tablet can crash and stop working now and then. When that happens with your Fire tablet, you can easily perform the equivalent of a reboot with your computer with a technique called a hard reset. This one’s simple. Press and hold the Power button on the top of the Fire tablet for about 20 seconds. (Ignore the Do You Want to Shut Down your Fire prompt and just wait for the device to turn off.) Press and hold the Power button again, and your Fire starts up, often causing whatever made it crash to resolve itself. For most people, encrypting data (treating the data so it can’t be read by others) isn’t that important. Still, if you have data on your Fire that you want to keep private, you can use a setting to encrypt the data on the tablet. 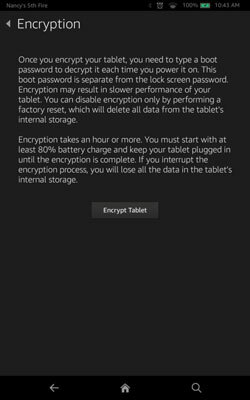 You should know that if you encrypt your data you’ll be required to enter a password in addition to any lock screen password you may have set up to access your Fire tablet. In addition, encrypting your data requires that your Fire be at 80-percent charge or more, and be plugged in while encrypting. The process takes about an hour or more, and encryption will be disabled if you reset your Fire to factory settings. Swipe down from the top of the Fire screen and tap Settings. 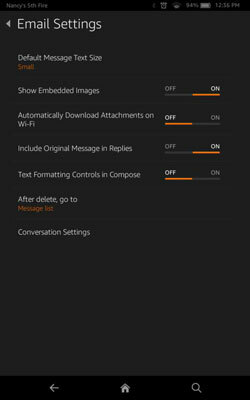 In the settings that appear, tap Encryption. Tap Encrypt Tablet to proceed. 5Access apps from other sources. You can use a hidden setting that allows you to sideload apps you obtain from sources other than Amazon. When you sideload, you transfer to your Fire tablet from your computer. Swipe down on your Fire to reveal Quick Settings. Tap the Off/On switch for the Apps from Unknown Sources setting. The setting is turned on. 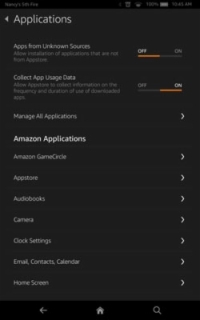 Now you can install apps that you got somewhere other than the Amazon Appstore on your Fire tablet. 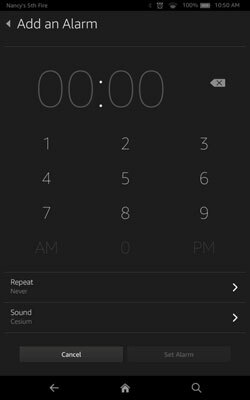 The Clock app is preinstalled on your Fire tablet, and it’s pretty simple to use. You’ll find it in the Favorites grid (unless you’ve removed it, in which case you’ll find it in the Apps library). Tap the Clock app and you see the time and two settings: Weekdays and Weekends. If you tap to turn on Weekdays, for example, and then add an alarm, Monday through Friday will be selected for the alarm for you. Tap the New button (shaped like a plus sign). On the screen that appears tap numbers to enter a time. Tap AM or PM. Tap Repeat. Tap the check box for the day of the week you want the alarm to occur. For example, if you want an alarm at 7 a.m. every weekday, tap the Monday through Friday check boxes. Tap the Alarm Repeat back arrow to return to the Alarm screen. If you want to change what sound plays for the alarm, tap Sound and then select a different sound. Tap the Alarm Sound back arrow, and then tap Set Alarm to save your alarm settings. The alarm now appears on your Clock screen; you can tap to edit it and use the switch on that screen to turn the alarm on and off. 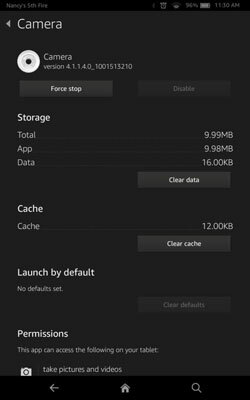 7Uninstall or force-stopping an app. Some apps that run in the background can use up your memory resources on your tablet. 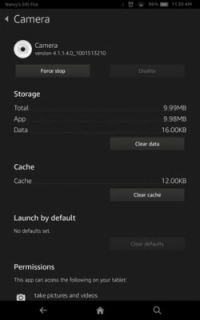 To minimize the impact of apps using up your memory, you can force an app to stop running. In addition, if there’s an app you’d rather get rid of, you can uninstall it. Swipe down to display the Quick Settings bar and then tap Settings. Tap an app. The screen shows what appears when you select the Camera app. Tap the Force Stop button. The app stops running. If you want to get rid of the app, tap the Uninstall button. A confirmation screen appears. Tap OK to uninstall the app, or tap Cancel to keep the app. 8View how much storage you have available. Fire tablets, like most tablets, have limited memory compared to your average computer. If you got one with very little storage, such as an 8GB 6- or 7-inch Fire, you’ll quickly run out of storage. This can slow your tablet’s performance or keep you from downloading any more content. 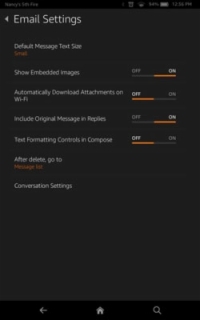 Display the Quick Settings and then tap Settings. Tap Storage. 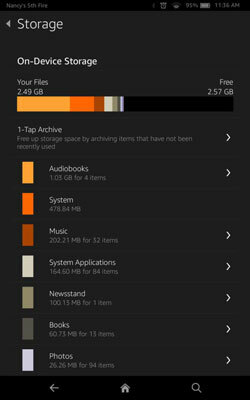 The colored bands in the Your Files display tell you, at a glance, which type of app or content is using up your storage space. 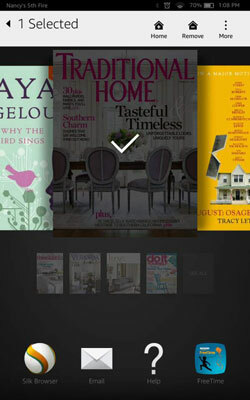 Tap a category such as Audiobooks or Applications to see which items in each category are taking up space. Tap a check box next to an item and then tap the Remove button to remove it from your device. You can also tap Clear All or Select All to take more global actions. 9Close all tabs in Silk. If you sometimes get into long browsing sessions on your Fire tablet using the Silk browser, you can end up with lots of tabs open. To get rid of the clutter, use this simple trick: With Silk open, press on any open tab. In the menu that appears, tap Close All Tabs (or tap Close Other Tabs to close all tabs but the one you’re pressed). Simple! 10Include original message contents in an email reply. Tap the Off/On switch for the Include Original Message in Replies setting.